Map showing location of Colorado on the US map. 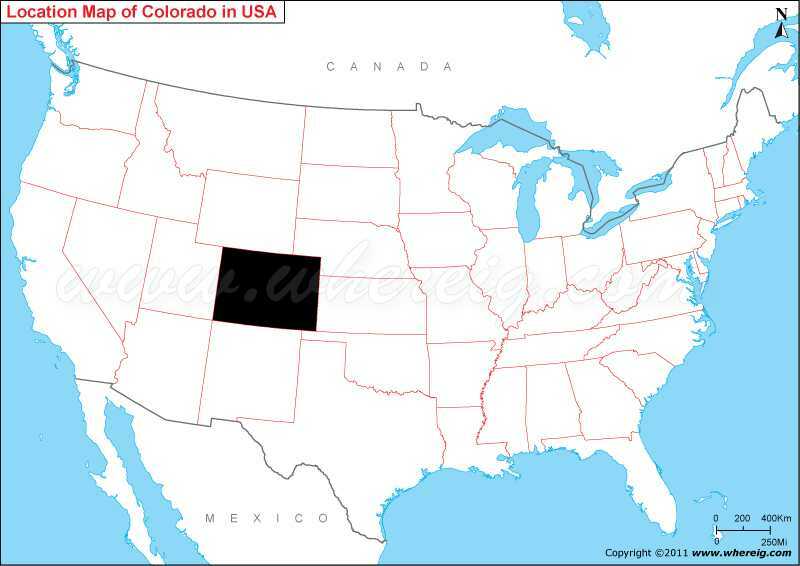 In the given Colorado location map it clear that Colorado is located in the central region of the USA. This is a landlocked state, largely covered by Southern Rocky mountains and Colorado plateau. However, the western region of the state has plain. Hence, it is recognized as the state with vivid landscapes of mountains, plains, canyons, and mesas. Surprisingly, about 30 major peaks of the Rocky Mountains lie in this state only. In addition, for the tourists’ point of view, Colorado has many attractions including 4 national park, 2 national historic sites, 2 national recreation areas, 6 national monuments, and many more recreational centers. As shown on the given map of Colorado State of the USA, it is bordered by Wyoming and Nebraska in the north, on the east by Nebraska and Kansas, on the west by Utah, and on the south by Oklahoma and New Mexico. Colorado is 38th state of the US constituted in the year 1876. Since then many developments have been taken place. The Colorado map shows the well developed roadways, railways and major cities. The Colorado state map also shows the capital city Denver situated in the north central part of the state.